The Sherfy Garden is a collaborative project of the Gettysburg Foundation, Gettysburg College, the Civil War Institute and the National Park Service. The garden was started in 2010, and the collaboration further developed in 2012, when Gettysburg College and the Civil War Institute became partners in the project. The National Park Service leases the Sherfy House and Garden to the Gettysburg Foundation, which oversees the garden from planting to harvest. Each year, a Gettysburg College student coordinator and Gettysburg Foundation volunteers help plan, plant, maintain and harvest the garden. The Civil War Institute funds the project each year, covering the student coordinator, seeds and supplies as needed. The Sherfy Garden is located on the Sherfy Farm within the Gettysburg National Military Park. 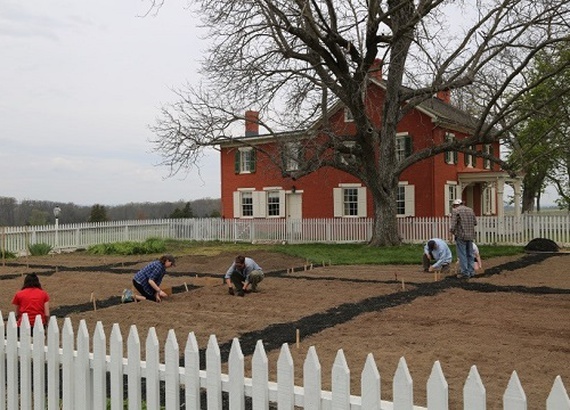 Because digging on the Gettysburg Battlefield is prohibited, an alternative garden plan was needed. In the early spring of 2010, volunteers covered the former garden area with cardboard and then added 12 inches of topsoil to begin the current garden. The new Garden remained fallow until the spring of 2011, which allowed time for the cardboard to disintegrate before tilling and planting were done. Since 2012, all produce from the Garden has been donated to the Campus Kitchen at Gettysburg College. The Campus Kitchen is a food redistribution facility, capable of storing, canning and distributing food to local food banks and meals on wheels programs throughout the Gettysburg region. In 2013, more than 500 pounds of food from the Sherfy Garden was sent to the Campus Kitchen. In 2014, that amount almost doubled to more than 900 pounds! The Garden now provides an average of 1,000 pounds of food per year to the Campus Kitchen. Each August, incoming Gettysburg College freshman students from the College’s Center for Public Service are given a working tour of the garden. Students also come out to the garden each spring on Earth Day to help plant crops. Crops in the Sherfy Garden are grown organically from heirloom seeds, and plants are started in the greenhouse at the Eisenhower National Historic Site. The Gettysburg Foundation is pleased to be part of the Sherfy Garden collaboration. Find out how you can become a Sherfy Garden Volunteer.